Cole Hamels produced a 1.53 ERA in his last four starts. I’ll say it again: It’s too early for serious trade talks. Teams historically do not get serious about upgrades until after the amateur draft in early June. And even then, the market generally is quiet for another month. 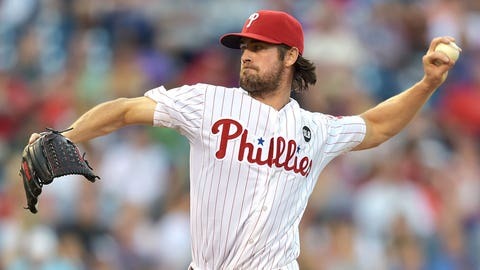 Still, if you’re a contender and you need a top-of-the-rotation starter, wouldn’t it behoove you to move on Phillies left-hander Cole Hamels as quickly as possible? Phillies general manager Ruben Amaro Jr. is waiting for teams to call — and telling them that he is willing to add cash to deals for every one of his high-priced players, including Hamels, as long as it enhances his return. Hamels has produced a 1.53 ERA in his last four starts and shut down the Nationals and Rockies, two of the National League’s top offensive clubs, in his last two. What’s more, recent history suggests that once he gets on a roll, he doesn’t stop. In 2013, Hamels had a 2.96 ERA in his final 21 starts. In ’14, he missed most of April due to left biceps tendinitis, struggled early, then had a 2.06 ERA in his final 27 starts. Now here he goes again. Hamels’ average fastball velocity in May is 93.59 mph, a monthly figure he did not reach last season until August. His strikeout rate, over a full season, would rank among the best of his career. His walk rate is dropping, and after allowing seven homers in his first three starts, his home run rate also is returning to normal. Hamels has allowed only one homer in his last seven outings, none in his last four. 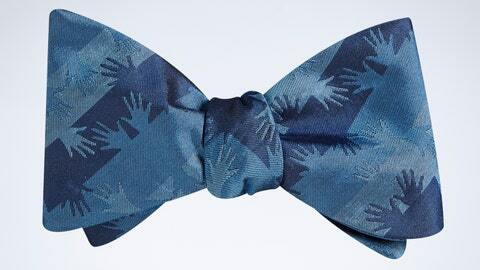 Each week, FOX baseball insider Ken Rosenthal partners with former NFL player Dhani Jones’ Bowtie Foundation (bowtiecause.com) by donning neckwear to raise awareness for various charities. Click here to see what Ken is wearing this week and to find out how you can get involved. Get him now, get him while he’s hot. Hamels is owed about $90 million over four years or $105 million over five, depending upon whether he is traded to a club on his no-trade list and requires the club to exercise his option. Thus, he already is a bargain by today’s standards and will become even more of a bargain if Amaro kicks in, say, $10 million, to get better prospects. This shouldn’t go to July 31. Not if the suitors are smart and want as much as they can get out of Hamels in 2015. The Marlins’ hiring of Dan Jennings as manager remains the talk of the industry, in part because the fallout from the move threatens to be so wide-reaching. ● The effect on Giancarlo Stanton. The face of the franchise can’t publicly complain — he took owner Jeffrey Loria’s money. But what are the odds that Stanton wishes he could get a do-over? Didn’t he sign his $325 million contract only after the Marlins promised him they would run a more coherent operation? Stanton’s principal fear was that the Marlins would not surround him with enough talent — playing talent, that is, not managing talent. There is simply no way he could have imagined that the team would replace a manager he liked, Mike Redmond, with a total newbie, Jennings. Now Stanton is stuck — he cannot opt out until after the 2020 season. ● The relationships between the players and Jennings. Jennings was part of a front office that beat right-handers Mat Latos and David Phelps in arbitration last offseason, persuaded lefty Mike Dunn to sign a two-year, $5.8 million deal to avoid a hearing and settled four other cases. Twelve Marlins are eligible for arbitration next offseason, raising the question: Will those players be comfortable speaking candidly to a manager who could end up back in the front office, making an arbitration case against them and using information that he gathered during the season in a hearing? The possibility certainly exists: The Marlins have said only that Jennings will manage through the rest of the season. Jennings obviously wants to win, and he has named one of the arbitration-eligible players, right-hander A.J. Ramos, his closer, setting him up for a higher payday. But the potential for distrust is far greater than it would be with a conventional manager. ● The audacity of naming a novice. 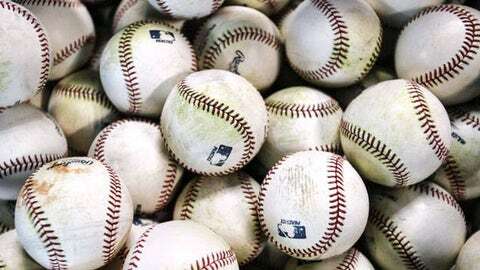 Think about it: Players compete against hundreds of peers to reach the majors. So do coaches and managers. Yet, by hiring Jennings, the Marlins effectively are saying that the entire system is outdated, and they’ve got a better plan. Again, look at it from the perspective of the Marlins’ players. As a group, they’re earning nearly $70 million. Every day, their careers are on the line. Shouldn’t they be playing for the very best managers, legitimate experts at their craft? Granted, you could make the same case against all of the former players who became managers with no previous experience, but the hiring of Jennings goes a step beyond. It’s unsettling for the players, unsettling for actual managerial candidates, unsettling for the industry. We all know the deal — fans, media, players and executives cannot officially renew the Mike Trout vs. Bryce Harper debate until Harper proves that he can stay healthy over a full season. Trout has averaged 151 games the past three seasons, winning the AL MVP in 2014 and finishing second the two years before that. Harper has averaged 119 games over that same period, finishing 30th in the 2012 NL MVP balloting and no higher in any other year. Still, Harper’s incredible start at least revives the possibility of a rivalry that looked so promising when the two players were starting their respective careers. Harper’s major-league leading 1.198 OPS dwarfs not only Trout’s .943 but everyone else’s in baseball. Trout, at 23, is 14 months older than Harper, and obviously more accomplished. But who says this has to be an either/or proposition? If both continue their upward trajectories, why can’t Trout be this generation’s Willie Mays or Mickey Mantle and Harper this generation’s Hank Aaron or Frank Robinson? FIRST MEA CULPA OF THE YEAR! When the Red Sox fired Juan Nieves as pitching coach, I tweeted, “Suggestion: Find better pitchers.” I then wrote critically about the way general manager Ben Cherington constructed his pitching staff. Nieves, in my view, was a scapegoat, nothing more. Well, the Red Sox’s early performance under new pitching coach Carl Willis suggests that the change indeed had merit. Consider these before and after numbers for the Sox since Willis took over, courtesy of STATS LLC. The Sox, under Willis, want their pitchers to dictate the tempo from the mound rather than react to the offense, use their individual strengths instead of worrying too much about exploiting hitters’ weaknesses. Questions remain about the actual quality of the Sox’s staff; righty Joe Kelly lasted only 1 2/3 innings Sunday against the Twins. But at this early juncture, it’s difficult to argue with the switch from Nieves to Willis. 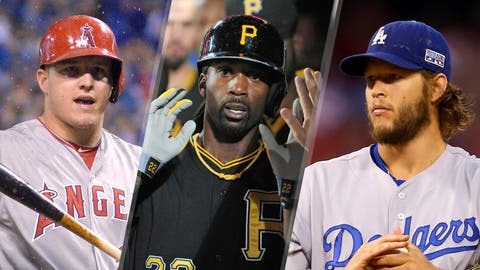 Every so often, I’ll hear of a player who is popular among the clubs that are deepest into analytics — the Dodgers, Athletics, Rays and Indians, to name four. Right-hander Mike Bolsinger is such a player. The Dodgers and Athletics were among the clubs that pursued Bolsinger when the more traditionally minded Diamondbacks designated him for assignment last November, and the Dodgers acquired the pitcher for cash considerations. So far, the move could not be working out any better — Bolsinger, after joining the Dodgers’ rotation due to injuries, has a 0.71 ERA in four starts, albeit with help from a .213 opponents’ batting average on balls in play. What did the Dodgers and Athletics see in Bolsinger? An executive with one of the clubs directed me to two articles that help explain the attraction — one by Daniel Brim on Dodgersdigest.com and the other by Eno Sarris on JABO. For one thing, both Bolsinger’s Fielding Independent Pitching (performance based on statistics that do not involve fielders) and xFIP (a version of FIP with a normalized home run rate) suggested that he was better than his 5.50 ERA with the D-backs indicated. Bolsinger also had a very small velocity difference between his cutter and curve, the only two pitches he throws, and a curve 2 mph faster than average. By blending them into almost a continuum, as he has done this season, he becomes more effective. The data also showed that Bolsinger threw more pitches inside the strike zone than the average pitcher last season and elicited a higher percentage of swings at pitches outside of zone. His minor-league numbers, too, were intriguing. He allowed only six homers in 91 2/3 innings pitching in a hitter-friendly park in Reno, Nev., and the hitter-friendly Pacific Coast League. Does any of this ensure that Bolsinger will be an All-Star? Of course not — he’s 27, and could revert to a journeyman at any moment. But teams search the margins for any edge they can get, and for the Dodgers, the acquisition of Bolsinger already qualifies as a success. 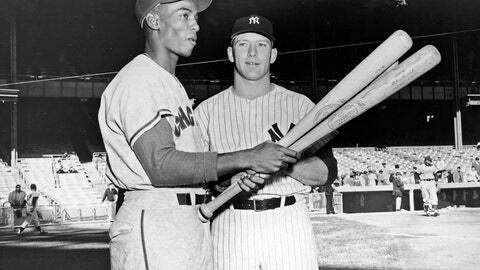 Ernie Banks and Mickey Mantle are two members of the elite group. Who are the other 25? Maybe more older players should try the gluten-free, sugar-free, dairy-free diet that Yankees first baseman Mark Teixeira, 35, adopted in the offseason. Teixeira, who said he again wanted to become a 30-homer, 100-RBI player, is on a 47-homer, 112-RBI pace. His batting average is only .236, but his OPS is .924, 13th best in the majors. In an age of swing and miss, Teixeira also is proving that rare player who walks more than he strikes out. Carlos Santana and Anthony Rizzo are the only other players with a minimum of 20 walks who currently are managing that feat; Stephen Vogt has the same number of each. Teixeira’s only full season with more walks than strikeouts was 2008 (97-93). Jose Bautista (104-96) and Victor Martinez (70-42) were the only players to do it last season, and Coco Crisp (66-66) had the same number of each. ● One more note on Trout: He told me that his insanely athletic, Matrix-like slide into third base at Fenway Park on Friday night was a first, but similar to a move he once pulled off in the minors. In case you missed it, Trout on Friday hooked his right arm around third baseman Brock Holt’s tag, pulled back his left arm and then stayed on the bag with his right leg as his momentum pulled him forward. Trout said that in the minors, he once pulled back his left hand and touched the base with his right, but the difference was that he didn’t slide past the bag. His body control on the play at Fenway was simply breathtaking. ● Ron Washington, back in baseball with the Athletics as an infield coach, had a star pupil from one of the team’s rivals during the offseason — Angels second baseman Johnny Giavotella. The two worked together for two months straight, Giavotella said. Washington helped Giavotella abandon his tendency of letting the ball travel to him, instructing him to move his feet to get the proper hop. Advanced metrics portray Giavotella as below-average defensively thus far, but it’s possible that he is indeed improved and the metrics are not yet reflecting it. “I credit all the confidence I have in my defense to him,” Giavotella said. ● A year ago, the Orioles ranked first in the AL in OPS from left field with Nelson Cruz and third in OPS from right with Nick Markakis. This season, with both players gone, they rank 11th in left and 12th in right. Three of their left-handed hitting corner outfielders – Alejandro De Aza, Travis Snider and David Lough – are similar types, all lacking power. Markakis, too, lacks power, and for the Orioles, matching the Braves’ four-year, $44 million offer to him in free agency likely would have been a mistake. Still, if not for the surprising contribution of Jimmy Paredes at DH, the Orioles’ offense would not even be middle-of-the-pack. They could use a slugging corner outfielder. ● A power vacuum at Rogers Communications might be one reason that Blue Jays manager John Gibbons keeps his job through the end of the season. Keith Pelley, the president of Rogers Media, is leaving to become commissioner of the European golf tour. Jays president Paul Beeston will remain in his position only through the end of the season. And general manager Alex Anthopoulos probably is disinclined to make a change with Gibbons when he shares responsibility for the team’s struggles. The return of shortstop Jose Reyes and improved health of right fielder Jose Bautista should help the Jays better compete in the mediocre AL East. ● Mariners second baseman Robinson Cano is batting only .253 with a .632 OPS, but nothing in his peripheral numbers suggest anything that is particularly alarming. Cano’s line-drive and ground-ball rates are approximately the same as they were last season, when his OPS-plus was comparable to what it was in his final two seasons with the Yankees. His hard-contact percentage actually has improved, going from 28.5 percent to 32.6 percent, well above league-average. Yet, just as he did at the same point last season, Cano has one home run in 174 at-bats. ● Pretty cool to see how Ryan Hanigan and even Christian Vazquez are aiding Red Sox rookie catcher Blake Swihart in his transition to the majors. Hanigan, in the words of Wade Miley, is “doing wonders” for Swihart, sitting in on meetings, discussing game-calling in the dugout. ● The average fastball of the Angels’ relievers entering the weekend was the lowest in the majors at 89.8 mph, but their bullpen succeeds due to a variety of arm angles, repertoires and overall pitching savvy. Some with the team believe that the team could use a hard thrower in the seventh inning to fill the role that Kevin Jepsen served last season, but the Angels are unlikely to prioritize bullpen help as a need.